On the roof of a medical building in San Francisco, Sprint Nextel has a cell site that’s far above the cramped canyons of the city’s streets, but despite the wide-open views, space is limited. Sprint shares the roof with other mobile operators also taking advantage of its high vantage point, and each needs backup power supplies in addition to the large, raised cabinets that contain their cellular base stations. That’s one reason Sprint is now putting all its services into one box and deploying smaller radios that can sit next to its antennas at this site, as well as at other buildings and cell towers across the country. 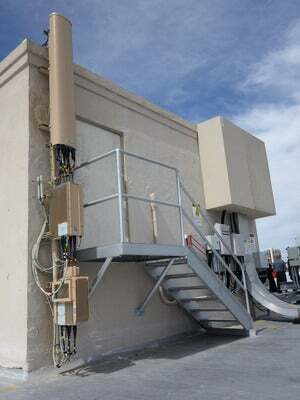 At a rooftop cell site in San Francisco, a Sprint Nextel antenna, left, is mounted on above two radio heads, one for 1.9GHz frequencies and one for 800MHz. The project, called Network Vision, will also boost the range of Sprint’s cells and make it easier to add more frequencies and network types in the future, the company says. That’s important to the nation’s fourth-largest mobile operator, which will still be using three different cellular technologies even after it shuts down its aging Nextel system at the end of this month. At the cell site that Sprint showed off to reporters on Tuesday, one of about 2000 in the San Francisco Bay Area, the company has its old equipment alongside the new gear. It consists of two cabinets, each the size of a large refrigerator, just for the carrier’s 3G CDMA voice and data service. Alongside them are another large cabinet for wired telecom connections and one for backup batteries in case of power failure. Next to those four boxes is the Network Vision gear, consisting of a smaller cabinet and battery pack. That’s where Sprint is running its LTE service on frequencies set aside for it in the 1.9GHz band. The new gear is also much more compact: The work of each of the old cabinets can be done with one rack module, called a “digital unit,” in the new box. Alongside those are units for Sprint’s LTE service on the same band, plus modules for improved 3G voice service on 800MHz, the band that the company is getting back by closing down Nextel. The same cabinet can hold future units for LTE in the 800MHz band, as well as gear for the 2.5GHz band. Clearwire, which currently provides Sprint with its WiMax network, will use 2.5GHz to deploy its own LTE network that will complement Sprint’s. Through a hosting deal, it will deploy that gear in the Network Vision cabinets. Inside Sprint Nextel’s Network Vision cell-site cabinets, there are rack-mounted modules called ‘digital units’ for each network the carrier operates. The gear here was made by Samsung. With old technology, each of those services would have required its own cabinet and batteries in every location where Sprint needed them, said Joe Meyer, Sprint’s vice president of network service management. Network Vision is a huge undertaking for Sprint, announced in 2010 and estimated to cost more than $4 billion. Sprint expects the work to be largely done by the end of this year. The upgraded network uses equipment from three different vendors, including Ericsson, Alcatel Lucent and, in this region, Samsung. In addition to saving space and power, the Network Vision architecture actually extends the range of each cell by about 15 percent, Meyer said. That means Sprint subscribers can spend less time roaming on other carriers’ networks. The two Sprint Nextel cabinets on the right can do the work of all the older boxes on the left, plus handle new services. Part of the performance gain comes from the rest of the equipment up on the roof. In addition to the base station, each cell site has radios and antennas. In the past, the radios have been inside the base station cabinet and linked to the antennas over coaxial cable. Whenever analog signals have to travel from antenna to a radio, part of the signal is lost, and coming down from a full-size cell tower, that can be a big loss. At Sprint’s new cell sites, like the one in San Francisco, the radios are smaller and can be mounted right below the antennas. The links from the radios to the base stations are fiber carrying digital bits, with no loss. Sprint also now uses fiber for the backhaul out of its new base stations to the wired network, which in this case is provided by AT&T, the local incumbent wireline carrier. The fiber carries ethernet at between 100Mbps (bits per second), many times faster than the former 1.5Mbps leased lines, and is more economical, Meyer said. Where needed, the ethernet can be turned up to 1Gbps, Samsung engineers said. Though Network Vision helps with space and other issues, setting up cell sites is still hard work. Getting permission to build under local zoning laws is a challenge, as well as doing the civil engineering to get the gear set up on roofs and towers. And each market has its own issues. “San Francisco is a really interesting market,” Meyer said. “You’ve got a lot of hills, you’ve got mountains around the Bay Area, you’ve got a lot of water. It’s one of the most challenging markets to cover. Not to mention, you’ve got a lot of unique architecture and building codes that we have to work through.” The cell also needs to be tested for 9-1-1 emergency calling, a step that hadn’t been completed for the San Francisco site. All told, it takes about 18 months to get a cell site up and running, according to Sprint.